Home Awesome Products Little Fish with a Big Mouth! Little Fish with a Big Mouth! On Kidology.org we have nearly 100 vendors many of whom are very small ministries with big hearts for reaching and teaching kids. Today, I would like to highlight on of the hidden gems in our store called, Little Fish with a Big Mouth. It is a beautifully illustrated story imagined right from the pages of Scripture. 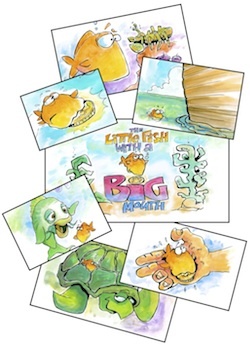 In this video lesson, kids meet a little fish who played a big role in helping Jesus demonstrate his power in Matthew 17: 24-26. It comes with a lesson plan, fun coloring pages and the video. Let me encourage you to check it out and have on hand for when you have a special event or opportunity for a short, simple and engaging lesson for your children.